1,Pretty colors special design for children. 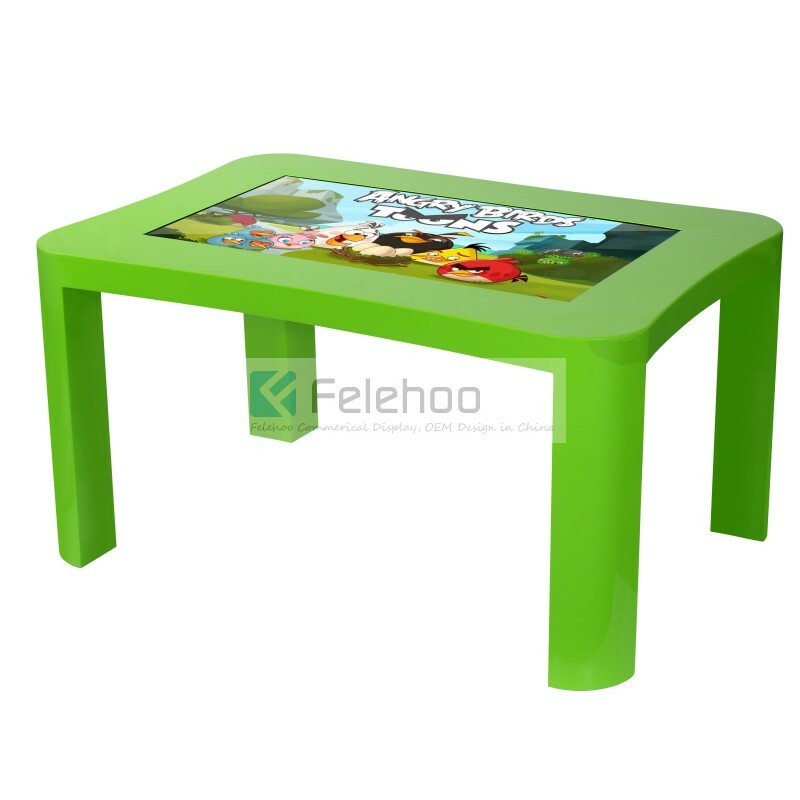 2,Interactive Multitouch Table with high quality Screen. 3,Capactive 10points (Max. 60points) touch screen. 1.High resolution 1080P,make sure the high touch accuracy. 2.Support real multi touch , lines will not get cross when multi people writing/drawing at the same time . 3.Software develop kit can provide you , then you can develop some software by yourself . 1.1080P , makes the picture more clear. 2.Much more health to our eyes and environment. 3.Monitor will not get very hot when using some hours. 1.Q: I do not like your case,it seems not very fashion,could you change it? A: Yes,we could change it and produce as special design if you could offer design drawing. 2. Q: I only order 1 sample,but i have my requirements,could you offer? A: Yes,we could offer if you could offer all the configuration datas. 3.Q: How can you shipping?It is very large and damaged easily. 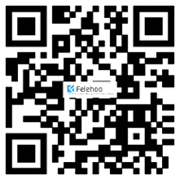 A: We have air shipment and sea shipment supplier,they can offer good service you could choose. We suggest that you could pay little fee for wooden box packing. 4. Q:How can you guarantee the quality of this Products? 5.Q:Why is your price some time a little more expensive than others? 6.Q:Everybody say it's good quality, so how to prove, how can I trust one and who can I trust? 7, Q: what color can we choose ? A: Our standard color is black or silver, but you can customize other colors. 8,Q: How long you can finish the machine? A: For the sample order, we can finish the production within 10 working days, If we have it in stock, we can send you the sample within 3 days after received your payment. 9, Q: How long is your warranty ? And what's the detail content ? 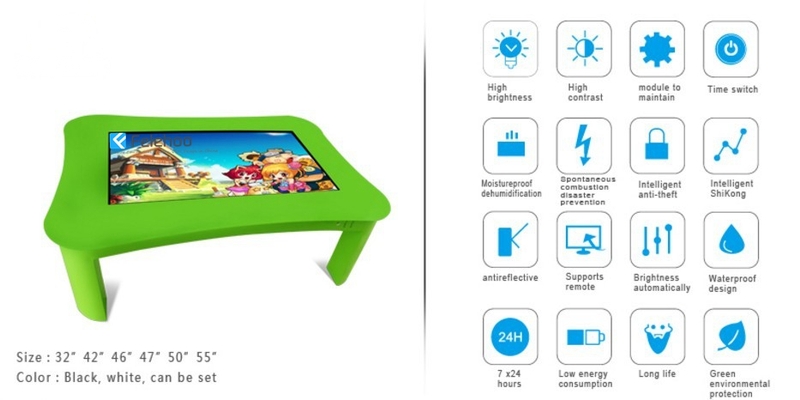 10,Q: Which size of interactive touch screen table do you have? 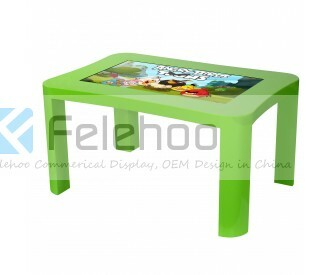 9,Q : Why choose felehoo interactive touch screen table ? 10. Q : what payment can you accept ?